WASHINGTON, Nov. 16 (Xinhua) -- The United States space agency NASA and European officials celebrated in Florida's Kennedy Space Center on Friday the arrival of a powerhouse that would propel NASA's new capsule to the moon in an unmanned flight planned for 2020. 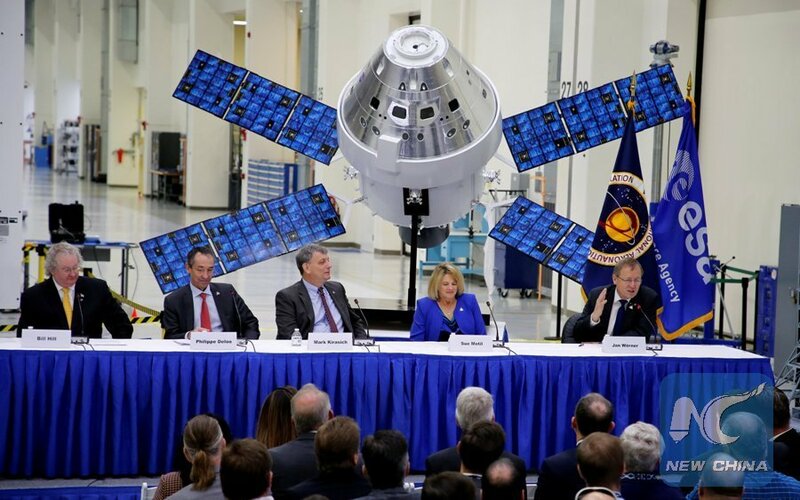 "The service module will provide power, air and water to the Orion spacecraft on missions to send humans to the Moon and beyond," said NASA administrator Jim Bridenstine on his Twitter account. Orion's European Service Module arrived from Germany on Nov. 6, 7 years after NASA announced it would rely on the European Space Agency to provide the critical flight hardware. The European component "allows us to take people farther into space than we've ever gone before, so it is a really big event for all of the Orion program," said NASA's Orion program manager Mark Kirasich. Orion, NASA's next-generation moonship, is slated to fly near the moon with a mega rocket developed by NASA, known as SLS for Space Launch System. Its future missions include a manned journey, with the goal of building an outpost just beyond the moon that could enable lunar landings and Mars expeditions, according to NASA. The Orion capsule once flew 5,800 km above Earth in 2014, but its flight on SLS has been repeatedly delayed.